Fiddleheads in Brown Sage Bacon Butter is plate licking delicious. I was surprised to find these little beauties at the market. Its so cold here, I thought we were weeks away from picking fiddleheads. Funny how it goes. Weather-wise we’re having a miserable spring and still Mother Nature pushes on. I’m not sure how readily available fiddleheads are around the world but here in New Brunswick they grow wild near brooks and streams. 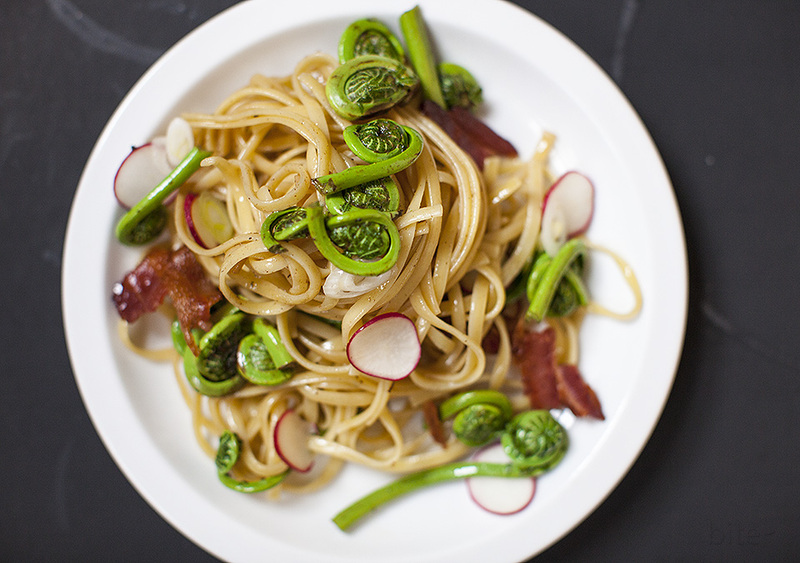 If you can get your hands on some fresh fiddleheads, this pasta dish is delicious. Frankly, what doesn’t taste yummy with sage butter and bacon – hello! Prepare linguine according to manufacturer’s instructions. While your pasta is cooking, place a large heavy bottomed skillet over medium heat. Remove bacon from skillet to some paper towel. Add clarified butter to skillet. When the oil and butter are frothing, add your sage leaves. Fry until crispy then turn over and repeat. Remove crispy sage leaves to paper towel. Add cleaned and trimmed fiddleheads to your skillet and sauté until fork tender – stirring often. When your paste is done cooking, drain into a colander and leave until needed. When the fiddleheads are tender, add your cooked pasta to the skillet and toss until the pasta strands are well coated with the bacon fat and butter mixture. Break the crispy bacon into large bits and add to the pasta – toss well. Divide the pasta between 4 serving dishes. Sprinkle each dish with the sliced radishes and green onion. Serve immediately with sea salt, freshly ground pepper, crispy sage leaves and grated Parmesan. THE LOVE: To clean your fiddleheads, fill your kitchen sink up with cold water and let the fiddleheads soak for 15 minutes. All the loose bits will settle to the bottom of your sink. As you remove the fiddleheads, trim off any overly brown brown stems. Add cleaned and trimmed fiddleheads to your skillet and sauté until fork tender - stirring often. Break the crispy bacon into large bits and add to the pasta - toss well. Serve immediately with sea, freshly ground pepper and grated parmesan. This entry was posted in pasta/risotto and tagged Canada, fiddleheads, Italian Food, Pasta by Michelle. Bookmark the permalink. Can you tell me please, what in the world are fiddleheads? I’ve never heard of it. Ty ! Hi Alex, fiddleheads are the shoots of wild ferns that grow wild along riverbanks in Atlantic Canada. We eat them as a vegetable in the spring.